Agrello cryptocurrency is one of the unique use-cases for blockchain technology. It comes with the ability to build self-executing code. The ‘smart contract’ code boasts of immense functionality be it in technology, finance, media, healthcare and public sector. The crypto develops an AI powered interface which allows you to easily create and manage smart-contract-based legally binding agreements. Even though Ethereum might have been the first in the arena, Agrello’s has come with a new design and approach which is definitely unique and fresh. Agrello cryptocurrency is end-user friendly and as such enables anyone to create smart-contracts. One doesn’t have to have coding or legal skills in order to use Agrello or create a legally binding smart-contract. The altcoin represents a shift from the traditionally centralized organizations towards a peer-to-peer economy. Among the people to benefit include financial managers, lawyers, brokers and machine operators. Like Ethereum, this altcoin can be applied in almost every other industry. For example, if you want to automate your monthly financial obligations to your grocery store or landlord, all you have to do is create a code. The code would be to create payment at a specified date and time. You will be required to write the code to be recurring each month. You will, therefore, never have to worry about forgetting paying for your groceries or rent or loan repayment. A team of Estonian high-level academics, lawyers and IT experts came together to create the Agrello cryptocurrency. The crypto is designed bearing in mind today’s technology, legal requirements and the need to observe the law, the Agrello blockchain basically addresses that. The team understands blockchain technology and has designed its blockchain to deal with all the hurdles that contemporary smart contract systems can encounter. And all this is to be achieved in a well-established legal environment. The team boasts of more than 16 years of research and a combined total experience of 45 years in the Estonia legal system. The Agrello ticker symbol is DLT which is the short form of DELTA. It is an Ethereum ERC20 token which allows users to access smart-contract building platform. The team behind the crypto assures the users that Agrello will be compatible with more than the Ethereum blockchain. DELTA tokens can be used to build smart contracts to run on Hyperledger, Ripple, Metaverse, and MONAX among others. This will essentially make Agrello a standard universal smart contract solution in a blockchain dominated future. The growth of this altcoin seems to be already taking an upward trajectory. According to Norta of Agrello, the firm already has many interested customers. For example, towards the end of 2017, there was an interested Estonian customer that builds IoT systems. There was also a Finnish electronics manufacturer as well as a number of Japanese firms. Agrello hopes its global roadmap will take them to 2020 when they hope to have a fully deployed solution for all users. Agrello started at a high price of $0.56 and a market cap of $40 million. The altcoin did not follow Bitcoin’s trend like a majority of 2017 cryptos. While Bitcoin was soaring past the $20,000 price, Agrello was commanding a lowly price of $0.2 on December 17th. It wasn’t until January 11th, 2018 that the altcoin reached its high of $1.72. Market cap at the time was $81 million. The price steadily dropped in February and March. 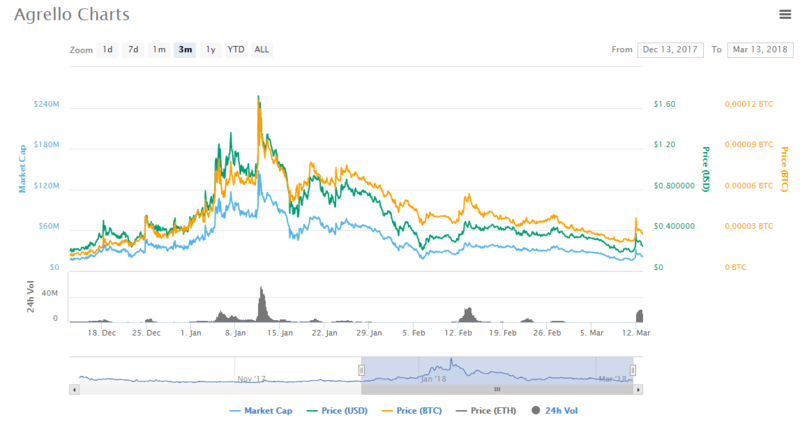 On 12th March, DLT closed at $0.249 while the market cap was $26 million.